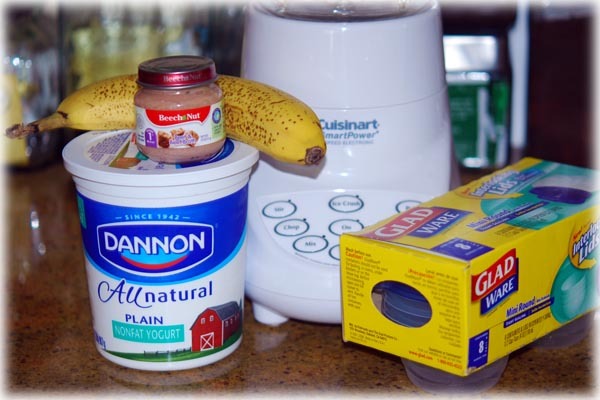 Put yogurt, banana and baby food into a blender and blend until smoothly combined. 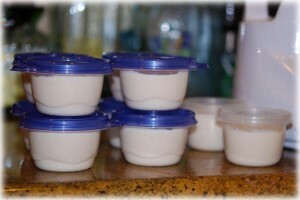 Pour into containers. Put on lids (or cover with plastic wrap) and place in the freezer. It takes a couple of hours to freeze. 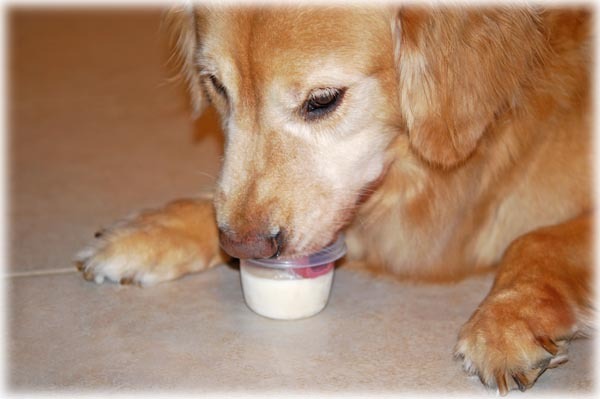 Once they are frozen solid, take one out and give it to your dog, remove the lid or covering, set it down and watch the fun begin. MONITOR YOUR DOG!!! If you have any concern that your dog will eat the container I recommend you pop it out into a bowl. It’s not difficult, just run a little warm water over it for a few seconds. I have never ever seen a recipe for something like this. My dogs are going to be very happy, very soon! Thank you SO much for sharing this here! It’s really easy and you can change things around. My only caution is that some fruits or vegetables might cause stomach upset, so you should try small amounts initially. Hey, leave out the baby food and that would be a great treat for my lunch :). I admit, I tasted it before I froze it. It wasn’t all that bad, altho it would taste much better without the meat. But it freezes really hard, so it would be hard for you to eat unless you put a stick in it. Then you got a popsicle! it’s perfect to make a dog happy, Pauli is proof ! She likes it. I don’t suppose kitties would like something so cold. What a great idea for these hot Texas summers! I bet China would love them! Just be sure she won’t eat the container the first time. Pauli just eats the frozen yogurt part and then leaves the container for me to wash.